On Monday, we revealed that Facebook was misusing an Apple-issued enterprise certificate that is only meant for companies to use to distribute internal, employee-only apps without having to go through the Apple App Store. But the social media giant used that certificate to sign an app that Facebook distributed outside the company, violating Apple’s rules. The app, known simply as “Research,” allowed Facebook unparalleled access to all of the data flowing out of a device. This included access to some of the users’ most sensitive network data. Facebook paid users — including teenagers — $20 per month to install the app. But it wasn’t clear exactly what kind of data was being vacuumed up, or for what reason. If you want to develop Apple apps, you have to abide by its rules — and Apple expressly makes companies agree to its terms. Each Apple-issued certificate grants companies permission to distribute apps they develop internally — including pre-release versions of the apps they make, for testing purposes. But these certificates aren’t allowed to be used for ordinary consumers, as they have to download apps through the App Store. Because Facebook’s Research and Google’s Screenwise apps were distributed outside of Apple’s App Store, it required users to manually install the app — known as sideloading. That requires users to go through a convoluted few steps of downloading the app itself, and opening and trusting either Facebook or Google’s enterprise developer code-signing certificate, which is what allows the app to run. Both companies required users after the app installed to agree to an additional configuration step — known as a VPN configuration profile — allowing all of the data flowing out of that user’s phone to funnel down a special tunnel that directs it all to either Facebook or Google, depending on which app you installed. Google’s app collected data and sent it off to Google for research purposes, but couldn’t access encrypted data — such as the content of any network traffic protected by HTTPS, as most apps in the App Store and internet websites are. Facebook, however, went far further. 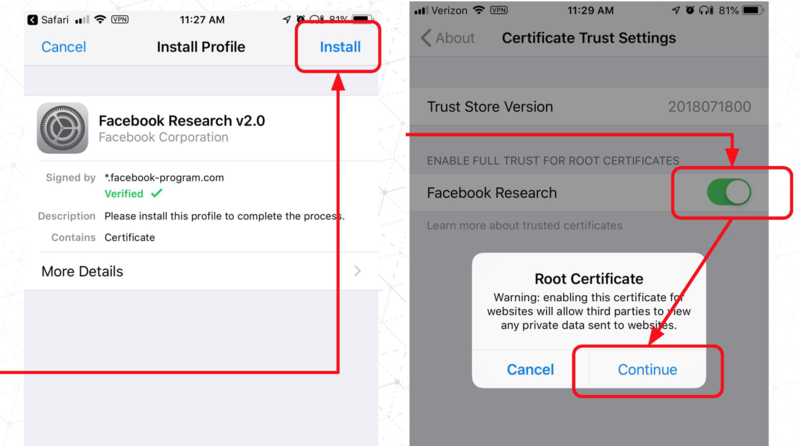 Its users were asked to go through an additional step to trust an additional type of certificate at the “root” level of the phone. Trusting this Facebook Research root certificate authority allowed the social media giant to look at all of the encrypted traffic flowing out of the device — essentially what we call a “man-in-the-middle” attack. That allowed Facebook to sift through your messages, your emails and any other bit of data that leaves your phone. Only apps that use certificate pinning — which reject any certificate that isn’t its own — were protected, such as iMessage, Signal and additionally any other end-to-end encrypted solutions. Google’s app might not have been able to look at encrypted traffic, but the company still flouted the rules — and had its separate enterprise developer code-signing certificate revoked anyway. In any case, Facebook already has a lot of your data — as does Google. Even if the companies only wanted to look at your data in aggregate with other people, it can still hone in on who you talk to, when, for how long and, in some cases, what about. It might not have been such an explosive scandal had Facebook not spent the last year cleaning up after several security and privacy breaches. Apple can’t control Facebook’s root certificates, but it can control the enterprise certificates it issues. After Facebook was caught out, Apple said: “Any developer using their enterprise certificates to distribute apps to consumers will have their certificates revoked, which is what we did in this case to protect our users and their data.” That meant any app that relied on Facebook’s enterprise certificate — including inside the company — would fail to load. That’s not just pre-release builds of Facebook, Instagram and WhatsApp that staff were working on, but reportedly the company’s travel and collaboration apps were down. In Google’s case, even its catering and lunch menu apps were down. According to many finding companies on social media, Sonos uses enterprise certificates for its beta program, as does finance app Binance, as well as DoorDash for its fleet of contractors. It’s not known if Apple will also revoke their enterprise certificates.